This past Thursday I saw celtic punk band Flogging Molly perform on March 6th at The Fillmore Detroit for their final round to the Green 17 Tour. The band has done the tour annually for the past ten years as a countdown to St. Patrick’s Day. They are one of my favorite bands and I have always looked forward to their shows because as a fan there is this familiar vibe of loving this music and knowing what to expect from the live shows. Throughout the decade I have attended five of the ten shows from the Green 17 Tours and every single time was so awesome it made my entire week better. The band is fan focused writing songs about liberty and hardship with hits like Black Friday Rule (2000) and Float (2008) while musically they fuse the speed of punk rock with celtic irish music. Front Man Dave King along with his wife and band mate Bridget Regan have a home in Detroit. I am sure this is why the annual Detroit show has been known for being a bit more over the top as they hit the stage loud and fast complete with an extended set list. The Green 17 show is usually set up the same way each year by starting off at 7:00 p.m. with a couple of opening acts and Flogging Molly will hit the stage around 9:30 p.m. King is always a lot fun as he will interact with the crowd making jokes and telling stories as they bring the house down jammin’ until midnight! This past show being the final one for the era of the Green 17 Tour was one of the best shows I have seen them put on throughout the years. They poured through all of my favorites like: Drunken Lullabies, (No More) Paddy’s Lament, Tobacco Island, Life in a Tenement Square, Saints & Sinners and Float to name a few. According to the bands official site Flogging Molly has ended their run with the SideOneDummy record label and formed their own called Borstal Beat. Their most recent release Speed of Darkness from 2011 was the debut recording at their own label. A new album is also in the works for 2015. 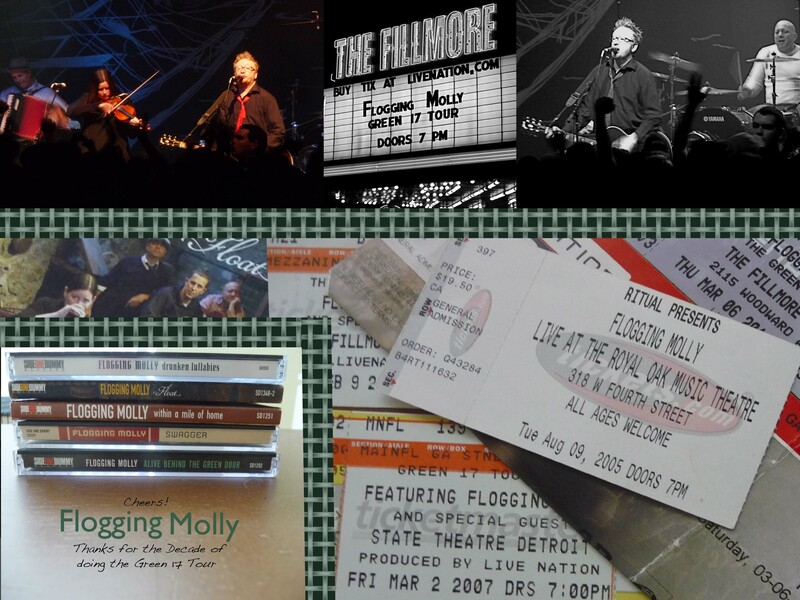 I can reflect on the first Flogging Molly show I went to in 2005 at Royal Oak Music Theatre. They had released the album Within a Mile of Home (2004) and at that time I only owned one album by them which was Drunken Lullabies from 2002, an album now considered gold according to the band’s website. Of course I loved them from that very first show and hearing Black Friday Rule for the first time as the encore was memorable for me. After that show I bought Within a Mile of Home and I also made sure I bought their debut album Swagger which had Black Friday Rule. All of the other albums released over the decade from Drunken Lullabies, Within a Mile of Home, Float and their most recent Speed of Darkness are all great albums that carry individual gems; But there is something about Swagger that makes it my favorite one. I think Swagger is perfection and I love every single song. I even scratched the first copy I had from playing the cd so much and had to buy it again! During the show, King reflected on the last decade of the tour and thanked everyone who has been a part of it. For the encore he came out wearing a Detroit Red Wings jersey because he is a fan and to honor Red Wings defenseman Nicklas Lidstrom. Lidstrom had a retirement celebration that took place earlier in the day. I love and appreciate Flogging Molly as a band and I am happy their audience has grown from the smaller venues like Royal Oak Music Theatre into consistently packing The Fillmore to rock out. Cheers to you Flogging Molly and I look forward to your next chapter.